Being a teenager, my granddaughter started to pick up interest on how the economy works, what are the real assets and liabilities in one’s financial planning. As the topic itself can be slightly “dry”, I made an attempt to discuss it in a way that was easier for her to digest. “Our national household debt to GDP ratio edged up to 87.9% last year. Is the number alarming?” she asked one day. “It depends. We have good debts and bad debts in life. For example, 10 years later, our new cars may have depreciated more than 80% and our new clothes would have been worn out. Those are liabilities. On the other hand, houses are assets as they will appreciate in the long run. Debts which are backed by appreciating assets are considered good debts,” I said. As she nodded in agreement with my simple explanation of good debts and bad debts, her question has piqued my curiosity to look into the details of our household debt. Overall, is our nation having more good debts or bad debts? 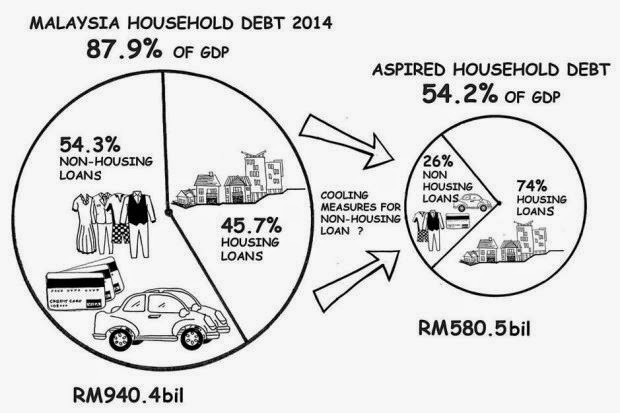 Bank Negara report shows that our household debt was at RM940.4bil or 87.9% of GDP as at end of 2014. Residential housing loans accounted for 45.7% (RM429.7bil) of total debts, hire purchase at 16.6%, personal financing stood at 15.7%, non-residential loans were 7.7%, securities at 6.5%, followed by credit cards and other items at 3.9% respectively. At first glance, our residential housing loans were the highest among all types of household debts. However, a recent McKinsey Global Institute Report highlighted that in advanced countries, mortgages or housing loans comprise 74% of total household debt on average. As a country that aspires to be a developed nation by 2020, our housing loans that stand at 45.7% is considered low. In other words, we are spending too much on other depreciating items instead of appreciating assets like houses. If advanced economies, which are usually consumer nations, have only 26% debts on non-housing loans, we shouldn’t have as high as 54% loans on items such as hire-purchase (which are mostly cars), personal loans, credit cards and others. If we were to follow the household debt ratio of advanced economies, our housing loans of RM429.7bil should be at 74% of total household debts, and other loans should be reduced from 54% to 26%, i.e. from RM510.7bil to RM150.9bil. With such reduction, total household debt would be slashed significantly from RM940.4bil to RM580.6bil (existing housing loans plus reduced non-housing loans), the amount would be at 54.2% of GDP instead of 87.9%. I am wondering why we can’t have a household debt to GDP ratio of 54.2% as illustrated above. Are we spending too much on depreciating items? Non-housing loans comprise mainly borrowings for cars, personal loans and credit cards. Car value depreciates about 10% to 20% per year based on insurance calculation and accounting practice. Borrowings for personal loans and credit card are also likely to depreciate over time which can be dubbed as “bad debt”. Perhaps it is time for the Government to introduce massive cooling off measures for non-housing loans in order to curb bad debt in our household debt. According to our Deputy Urban Wellbeing, Housing and Local Government Minister, our homeownership rate currently stands at 50% and the Government strives to increase the number with more affordable homes. As a comparison, almost 85% of Singaporeans are homeowners. We can expedite the above vision if more stringent measures are imposed on non-housing loans, it will free up more resources for household financial planning. The rakyat should be encouraged to secure a roof over their heads with effective execution of affordable housing policy by the Government. It is time to re-look our debt categories and reallocate our resources appropriately. If we are willing to cut back on cars, clothes, shoes and other depreciating items, reducing a household debt to GDP ratio of 54.2% is not only an aspiration, but an achievable reality. And the more beneficial effect is, more rakyat will have the financial resources to own a house, which is both a shelter and an appreciating asset.